Lions Gate is known as a top-tier independent production house in the West. They may not be as reaching as say MGM or Warner Bros., but even the average movie goer should be able to list off a title or two after they remember seeing the interconnecting clock-work mechanism lock of the preverbal “Lions Gate” before a film. Lions Gate as a company fascinates me for its ability to capitalize revenue for its productions. Whenever I bring up Lions Gate I usually reference their slew of adult focused Hard “R” action films or their very unsuccessful outings like Punisher: War Zone and Fido that suffer in theaters; whose existence is thanked solely to the cash cow that is Saw. 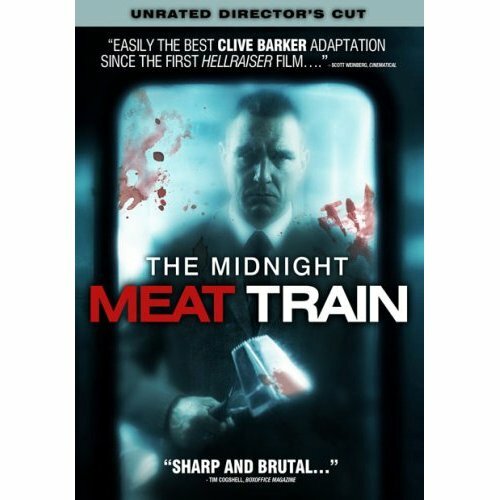 Tonight I decided to flip through the Lions Gate catalog and select a film that fits under the second category, 2008’s The Midnight Meat Train, for even films brought out by main stream distributers can have a unique or eccentric air about them. Midnight Meat Train is directed by Ryuhei Kitamura, who is known for both Versus and the Godzilla fan disputed powerhouse Godzilla: Final Wars. The story is based on one of Clive Barker’s earliest short stories released in the first, Books of Blood collection. It is interesting to note that Clive Barker also contributed self-made paintings for certain shoots. The story commences with a lonely man inhabiting a late night subway train, located deep in an unknown city. Startled by a banging noise, the complacent man’s startled notion coerced him into reaching for the connecting door. He slips, lands on his back in a puddle of blood, uneasiness sets in as he tries unsuccessfully to position himself amongst the fluid covered thus slippery metal. He hears the banging continue and finally peers into the connecting window, past columns of blood into the adjacent train car. A silver meat hammer shines through the dark, bashing flesh as it descends. The occupant screams. Leon (Bradley Cooper) is a photographer living in an unnamed city with his waitress girlfriend Maya (Leslie Bibb), who has been trying to capture what he considers the heart of the city through his photography. His method of scatter shooting local gangs in action in the dead of night leads to confrontation when he attracts their ire as they are caught roughing up a woman (Erika Sakaki) at a train station. Leon successfully deters the gangs’ responses by addressing a security camera positioned in view. The gang leaves and Leon watches as the thankful woman departs on an almost empty train, with only an imposing suit wearing man holding the door; Leon continues his photo taking as she embarks on the train from the platform. The next day, Leon sees a report that the woman he helped was a model, and that she disappeared in the night. Camera in hand Leon takes his photos to the police, and when they do not believe him, he starts his own investigation. Following the photos he took, Leon stumbles upon the larger man (named once as Mahogany who is played by Vinnie Jones) who rode the train during the same night that the model went missing. Leon stalks him during his daily routine following him from his apartment complex to his job at the meat-packing plant and then to his late night visit to the train station. After doing research at the local library Leon thinks that this man is connected to local disappearances that have been going on for the last century. He believes that he uses his butcher tools; a meat hammer, meat hooks, and iron apron to brutalize his victims. When the investigation turns to obsession, concern for Leon’s very sanity increases every passing day. Midnight Meat Train is truly effective as a horror film through its realism. Mahogany appears to be the sole menace terrorizing the passengers. And when he performs what is later revealed to be a semi-job for a higher power, you see that he does so with the most professional means. There are shots of Mahogany getting cleaned up for work in the morning by combing his hair and fixing his dress shirt which makes his work seem more methodic. He is human like everyone else, but purports this level of volume that makes his human actions tenser than anything that I have seen in quite some time. Pros: Leon and Maya are sizable characters that can keep up with the movie they are in; Modern Horror has made their normal lead roles almost antagonistic to which the audience really roots for, yet engaging enough that I felt actual concern about their survival. Vinnie Jones is imposing on his own, making his silent visage all the more suspenseful. Actually creates tension and fear, something new that I usually do not get from the type of Horror films I experience. Some excellent camera shots that make the train come alive. Cons: The CG distracts from certain shots. I will remark that there is more than enough red karo syrup for gore fans, but from time to time that pool of gushing blood looks as unreal as one can expect. Like many films before it (especially in Horror) Midnight Meat Train cannot get over its need to overly darken a scene. Making things “scary” aside, it is annoying when you have a hard time looking at everything in the shot. The Midnight Meat Train, as stated earlier, was put out by Lions Gate. There are a few good intense scenes and some impressive atmosphere from this one, and I believe that Mahogany is shooting right up there in my heart for most impressive Modern Horror killer. I cannot suggest this enjoyable film enough.